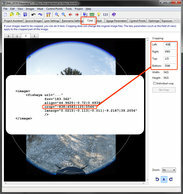 krpano uses simple xml text files for storing the settings for the krpano viewer. These files can be written or edited with any usual texteditor, but when writting the xml code, it is important that the xml-syntax-rules will be respected! These basic rules are the same for all xml files and not specific to krpano. This documentation is about the krpano xml structure, about all krpano xml elements, attributes and values and their mapping to their dynamic krpano variable names. The documentation is split into normal and 'advanced' parts. This was done for better readability and more clearness. The advanced elements and attributes are hidden by default and can be shown (or hidden) by pressing the show / hide advanced settings button withhin each part of the documentation. The root element of the xml file need to be the <krpano> element. All other elements must be placed inside this element. All xml elements and attributes in the krpano xml are optionally and can be defined a several times and in any order. When the same element will be defined again two or more times, then the later/following declarations will overwrite the previous ones. It's also possible to define additional <krpano> elements inside the	root <krpano> element itself for declaring additional settings at the krpano scope. The xml itself is just a transport-format - that means it will be only used to transport the data for the krpano viewer. When the xml will parsed, then the xml elements will be transformed/mapped into the krpano internal data structures. That means after parsing there is internally no xml anymore. Some xml elements and attributes are handled in a special way in krpano. This special handling happens already during the xml loading and parsing. When a xml element has a name attribute, then this element will be interpreted as element / item of an Array. The name of the Array is the name of the xml element itself. When no Array with that name already exists, it will be automatically created. When the element / item already exists, then the attributes that were defined at the xml element will be still set and overwrite already existing values. This means there can be several declarations of a xml element, but each element would need to have its own unique name for identification. Each name needs to begin with an alphabetic character! That means using a number as name is not allowed! When a name still begins with a numeric character, then the name will be interpreted as array index. This is okay for dynamic index-based access inside actions but not for defining the elements! All names will get converted automatically to lower case to allow direct case insensitive access! When a xml attribute is named 'url' or begins or ends with 'url' (e.g. like 'videourl'), the value of the attribute will be intrepted as url / path to a resource. When a relative path will be used as url value, then the path will be automatically adjusted to be relative to the xml file in which the url attribute was defined. That means relative paths in a xml will be always relative to the xml itself. But note - when setting / changing the url attribute dynamically, then there is no automatic relation to the xml anymore! %FIRSTXML% - Path of the first loaded xml file. %CURRENTXML% - Path of the current loaded main xml file (not the included one). %SWFPATH% - Path of the krpano viewer file. %HTMLPATH% - Path of the html file. %BASEDIR% - Use the basedir path. %$VARIABLE% - Use the value of the given 'VARIABLE' - this can be any krpano variable, but it must be defined before the current xml or scene will be loaded, e.g. already in the html file during embedding (via initvars) or before loadpano(), loadscene() calls. The devices attribute defines if the given xml element and all its children elements should be used or skipped on a given device. The value of the devices attribute can be one or more of the available devices. Resolving order: The AND checks will be resolved before the OR checks. Note - for checking for the devices settings dynamically in actions code, use the device object and the if() or calc() actions. 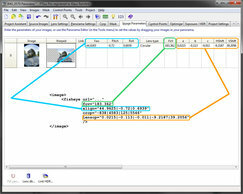 html5 Use only in the krpano Flash viewer. Use only in the krpano HTML5 viewer. handheld Use only on desktop devices. Use only on desktop and tablet devices. Use only on tablet devices. Use only on mobile devices. Use only on mobile and tablet devices. css3d Use only when CSS-3D-Transforms are available. webgl Use only when WebGL is available. multiressupport Use only when the browser is capable for multires. panovideosupport Use only when the browser is capable for panoramic video. fullscreensupport Use only when the Fullscreen mode is supported. fractionalscaling Use only when a fractional page-scale or pixelratio is set. mouse Use only on devices with mouse support. touch Use only on devices with Multi-Touch support. ios Use only on iOS devices (iPhone, iPod, iPad). ios### Use only when the iOS version is equal or higher than ###. ipad Use only on the iPhone (and iPod Touch). Use only on the iPod Touch. Use only on the iPad. android Use only on Android devices. androidstock Use only in the old 'stock' (=WebKit-based) Android browser. Newer Android browsers are based on Chrome. Use only in the Firefox browser. Use only in the Internet Explorer browser. Use only in the Microsoft Edge browser. Use only in the Safari browser. standalone Use only in the Standalone Flashplayer. linux Use only on Windows systems. Use only on Mac OSX systems. Use only on Linux systems. By adding a dot . character at the end of an attribute name and then there the names of one or more devices, it is possible to define that attribute only for that given devices. Everything before the first dot belongs to the name of the attribute itself and everything after the first dot belongs to the device check. All the devices as in the devices attribute can be used for the device checks. An .and. can be used as AND operator to check if all given devices settings are matching (like the + character in the devices attribute). An .or. can be used as OR operator to check if one of the given devices settings is matching (like the | character in the devices attribute). A no- prefix before a devices setting can be used to check if the given devices setting is NOT set (like the ! character in the devices attribute). Important to know: The order of xml-attributes is random and can differ each time! That means the order how the attributes were defined in the xml file don't need to be the same how they will be get loaded/parsed. Therefore never redefine attributes again other devices settings that would override previous definitions.! When a xml element has an if attribute, then the xml element and all its children elements will be only used when the given condition will be true. When using variables in the if condition, then these variables need to be defined before (=above) the current xml element. Additionally there is one special case here - when using xml if checks on <include> elements, then the variables used in the if check, need to be defined before the current xml gets loaded. This could be done in the html file during embedding by using the initvars setting or in the xml before doing a loadpano() call. The <style> element is a collection / storage element for any kind of attributes. Every other xml element that has a name attribute can also have a style attribute. When the xml element will be first created, all attributes defined at the <style> element will be copied to the element itself. This will be done before the attributes that are defined at xml element itself will be applied. That means it's possible to predefine some settings in the <style> element and then overwrite them later with the attributes defined directly at the element. In this case the value for the xml attribute will get from an other variable or calculated using an expression. The variables used in the get: or calc: need to be defined before (=above) the current xml element. Additionally there is one special case here - when using this on <include> elements, then the variables used there, need to be defined before the current xml gets loaded. This could be done in the html file during embedding by using the initvars setting or in the xml before doing a loadpano() call. The <include> elements will be resolved as first step during the xml loading. The requested include url file will be loaded and the content of the loaded xml will replace the <include> element in the current xml. After all <include> elements are loaded and resolved, the viewer will start to parse the loaded xml data and map the informations from xml to the dynamic runtime data structures and objects. This is the main / root element of a krpano xml file. All further xml elements need to be defined within this element. Advanced notes - when the xml gets parsed and resolved into the data structures the leading 'krpano' tag will be stripped away. This makes it possible to define another <krpano> elements inside the current one to define or redefine settings from the previous definition. Information about the krpano version that was used for creating the xml file. This is mainly only an information for orientation, but it should be still defined to allow handling potential compatibility-related version changes. The onstart event will be called directly at the start after the xml loading and parsing. The basedir setting defines the base directory for all following loadpano() action calls. This can be a relative or an absolute path and it's also possible to use the url placeholders here. The defaultvalue is %FIRSTXML% and that means that all relative xml paths of all following loadpano() action calls are relative to the first loaded xml file. The viewer background color. That background color can be only seen before a pano image will be loaded or when using partial panos / flat images that are not covering the full view. When set to a valid color number in hex format (e.g. "0xFFFFFF" for white), a background shape with that color will be rendered behind the pano. When not set or set to an invalid value - no background shape will be used, and it behave 'transparent' and shows the Flashplayer default background color (changeable in the html file) or the html page when using the wmode="transparent" embedding setting. Flash only: when set, it also allows using the mouse 'outside' the pano image for navigation (e.g. when using partial panos) and it allows the correct blending between differently sized partial panos. The time in seconds without any user-interaction before calling the onidle event. Change the color correction settings of the Flashplayer. Possible settings: "default", "on", "off"
Warning - there can be performance degrades when set to "on" ! Enable/disable the 'O' keyboard key, which switches the Output / log window on / off. Note - this parameter will be only checked once at startup! Enable or disable the 'strict mode' of the expression parser. When enabled variables will no longer 'automatically' resolve to their value inside expressions. This avoids accidentally mix-ups between variables and strings. Additionally some special backward-compatibility workarounds (like when comparing empty %N parameters) will be disabled. Should the output/trace log window open automatically when an error happens to show the error message. Should debug messages from plugins or action code be shown in the log. Additionally: When the debugmode is enabled, then the versioninfo field of the contextmenu will be always displayed and can be clicked or touched to open or close the krpano log. Define the url / filename to a small 'preview' panorama image that will be displayed while loading the full pano image. This preview image should should be small (in filesize and image dimensions) to allow fast loading! Note - For best rendering quality and performance the usage of cubestrip images will be recommended! High quality preview images (smoothed along all edges and all directions) can be easily created by using the krpano tools. Set the panoramic type of the preview image. When the main <image> is a partial pano, then the preview pano will use automatically the same hfov / vfov / voffset settings. The url / path to the preview image. This can be a spherical, cylindrical or a cubestrip (1x6, 6x1, 3x2 or 2x3) image. Defines the order of the images in the cubestrip image. With the <image> element the pano image will be defined. Set here the type, the sizes and the url paths to the images / tiles. <image type="SPHERE" hfov="360" vfov="" voffset="0" prealign="" type="SPHERE"
<image type="CYLINDER" hfov="360" vfov="" voffset="0" prealign="" type="CYLINDER"
Define the type of the panorama image. A cubical panoramic image - six images, one image per cube side. A cubical panoramic image as 'imagestrip' in one single image. Supported cubestrip formats are 6x1, 1x6, 3x2 or 2x3. The cube-side alignment itself always need to be: L,F,R,B,U,D (the krpano default). A spherical / equirectangular panoramic image. Partial panos are possible by setting custom hfov, vfov and voffset settings. When the type is not set, the viewer tries to detected the type automatically by the tags inside the <image> tag (that works only for non-multires images). Defines the horizontal field of view (hfov) of the pano image in degrees. This is the visible range that was captured on the pano image. The default value will be 360, which means a view all around. Use a smaller value for partial panos. For Flat panos (or normal images) the value "1.0" should be used. Defines the vertical field of view (vfov) of the pano image in degrees. By default (when no value was set), this value will be calculated automatically by using the hfov, the type of the pano and the side aspect of the pano image. Defines the vertical offset of the pano image in degrees. By default the pano image will be centered in the 3D space. This means the viewing range will be from -hfov/2 to +hfov/2 and from -vfov/2 to +vfov/2. Now when using a partial pano image where the horizon is not in the middle of image (not at 0 degree), then this image will be displayed distorted. The voffset can be used to shift the fov range up or down to center the image correctly in the 3D space. in the xml to allow viewing the whole partial image without viewing limitations. Enables the usage of tiled multi-resolution images. When set to true, then the <image> element need to contain several <level> elements with the image definitions for each multi-resolution level. The multiresthreshold value controls, depending on the fov/zoom, when to switch from one multi-resolution level to the next one. Suitable values are from -1.0 to +1.0. When there is too much aliasing, try negative values like -0.5. Define the tilesize for multires images. The index base (numbering start) for the tile indicies. Enables or disables progressive multi-resolution loading. Progressive loading means that the multi-resolution pano will be loaded step by step from low to high resolution. Only the tiles in the current viewing range will be loaded from level level. When disabled, then the tiles for current resolution will be loaded at first, and then when the loading of all current visible tiles was done, it will start preloading the lower resolutions of the current view. The labels for the %s cube side url placeholder. The default labels are l|f|r|b|u|d (left, front, right, back, up, down). Enables the usage of stereo images (HTML5 and WebGL only). When using cube images, then the image urls should contain a %t placeholder. This placeholder will be replaced by values from the stereolabels setting. For the left image the first value will be used and for the right image the second one. Note - depending on the pixel-size (and side-aspect) of the pano image or video, it can be necessary to set manually the hfov, vfov and voffset settings. With the prealign setting the pano image itself can be aligned / rotated. This can be used to correct a miss-aligned pano. where X, Y, Z defines the rotation about these axis in degrees. Dynamically changing the prealign setting is possible, but requires a updateobject(true,true) action call to update the image. Define the mapping / projection of the spherical input image. "equi" or "equirectangular" - Equirectangular projection (the default). "lambert" - Lambert cylindrical equal-area projection. Fisheye image support (HTML5 and WebGL only). With the fisheye settings it's possible to use fisheye photos and videos in krpano. For correctly straighten and aligning the fisheye image, it's necessary to know some parameters about it. A good tool for getting these parameters is PTGUI. The field-of-view of the fisheye image (in degrees). Related to the crop size. Source: Can be directly taken from the PTGUI fov image parameter. The aligment / rotation / leveling of the image (in degrees). Source: Can be directly taken from the PTGUI image parameters. The edges of the fisheye fov cropping circle (in pixels). The circle relates to the fov size. Source: Can be directly taken from the PTGUI crop settings. Source: Can be directly taken from the PTGUI lens settings. MJPEG image streaming over HTTP support (HTML5 and WebGL only). With this setting it's possible to use HTTP MJPEG video streams as source for the pano image. The supported images types are: <sphere>, <cylinder> and <fisheye>. The image url needs to point directly to to MJPEG stream source. and when there is no movement and standing still constantly update the video image. Manually set the update / refresh rate in frames-per-seconds. The video image will be constantly updated with that rate, regardless if there is a movement or no movement in the viewer. ... except IE11 and MS Edge are supported. Current frame and number of frames of the pano. It's possible to use several frames for a pano image, there the %f placeholder must be used in the image urls. That placeholder will be replaced with the current set frame number. Actionscript 3 Sprite object of the pano image layer. The count / number of all image level elements. The full / total size of the tiled image for this level. This setting will overrule the main image.tilesize setting for this level. Use this level as preview image. This also forces the whole level to be fully loaded. Depending on the image type and the related settings, the url of the image should contain several placeholders to allow addressing the right image file. Each placeholder can be used a several times in the url - e.g. as part of the filename and also as part of the foldername. By inserting one or more 0 characters between the % character and the character of the tile-index placeholder, it's possible to define a custom padding for the numbers. E.g. %h ⇒ 1,2,3,...,9,10,11, %0h ⇒ 01,02,03,...,09,10,11, %00h ⇒ 001,002,003,...,009,010,011. The view element contains the information about the current view. In the xml it can be used to set the startup view settings. The looking direction will be defined by the hlookat / vlookat attributes (=horizontal / vertical lookat), and the current field of view in the fov attribute. For viewing limits for partial panos, the limitview attribute can be used. The horizontal looking direction in spherical coordinates in degrees. The typical range is from -180° to +180°. The value will not wrap around 360° but the view itself will. The value 0.0 points to the center of the pano image. The veritcal looking direction in spherical coordinates in degrees. The typical range is from -90° upward at the zenith down to +90° at the nadir. The roll / rotation of the view camera in degrees. Defines the type of the field of view that the fov value represents. Note - on mobile and tablet devices the default value will be MFOV! The current field of view in degrees - from almost 0.0 to 179.0. The current horizonal and vertical fov values. Can values are read-only and can be used only for dynamically checking the current field of view coverage. The minimum fov value, this will limit the zooming into the pano. Note - maxpixelzoom setting can be used instead! The maximum fov value, this will limit zooming out of the pano. The maximum pixel zoom factor of the pano image. This will limit the fov automatically depending on the pano resolution and the current viewing window, e.g. 1.0 = limit to 100% zoom, no pixel scaling of the source image will be visible. Note - when set, this setting will overrule the fovmin setting, the fovmin value will be dynamically updated in this case. The size ratio for the maximum screen size calculation when using the fovtype=MFOV setting. By default the ratio of a 4:3 screen (4/3 = 1.333) will be used. Fisheye distortion effect (0.0 - 1.0). This value contolls the interpolation between the normal rectiliniear view and the distorted fisheye view. The fov and fisheye distortion settings are linked together (e.g. when zooming in - the fisheye effect will be reduced). This setting controls the correlation link between these two values: (0.0 - 3.0), 0=linear correlation, 3=dynamic correlation. Enables/disables the stereographic fisheye projection. The 'strongness' of the projection it is controlled by the fisheye setting. The stereographic projection allowes very interessting panorama views like the Little Planet Views. Apply a Pannini/Vedutismo projection (0.0 to 1.0). The 'strongness' of the projection it is controlled by the fisheye setting. Architectural projection (0.0 - 1.0). This value interpolates between the current projection (0.0) and the architectural projection mode (1.0). When enabled, the architectural projection will be only used in the 'middle' area of the pano. When looking more up and down then the architectural projection will slowly switch back to normal projection. Limit the viewing range in the pano. lookat - limit the lookat variables direct to "hlookatmin", "hlookatmax", "vlookatmin", "vlookatmax"
offrange - limit to the area set by "hlookatmin", "hlookatmax", "vlookatmin", "vlookatmax", but don't limit the zooming in any way. when the "hlookatmin", "hlookatmax", "vlookatmin", "vlookatmax" values were not set, they will be automatically calculated from the size of the pano image. The minimum horizontal looking position in spherical coordinates (-180 .. +180). The maximum horizontal looking position in spherical coordinates (-180 .. +180). (When hlookatmax-hlookatmin=360 then no limiting will be done) The minimum vertical looking position in spherical coordinates (-90 .. +90). The maximum vertical looking position in spherical coordinates (-90 .. +90). The current maximum horizontal looking range (same as hlookatmax - hlookatmin). The current maximum vertical looking range (same as vlookatmax - vlookatmin). Defines the area / window where in the pano image should be displayed. either by defining the size and the position (mode=align). or by defining padding borders (mode=border). It's possible to change/adjust these settings dynamically in the onresize event. When there are changes of the area settings outside of the onresize event, then a onresize event will be called on the next screen refresh, to allow a reaction on the next area/window size. Note - all <layer> or <plugin> elements will be placed inside this area. To place a <layer> or <plugin> element outside that area, set the parent attribute of that layer / plugin element to "STAGE". Select the area positioning / sizing mode. Possible settings: "align" or "border". Alignment / origin-point position of the area window on the screen. Possible values: lefttop, left, leftbottom, top, center, bottom, righttop, right, rightbottom. The x / y distance from the align point to the area window (only for mode=align). This can be either an absolute pixel values or a percent values that are relative to the screen width / height. The width / height of the area (only for mode=align). The distances from the left / top / right / bottom edges of the screen to the area window (only for mode=border). The resulting area position (from left-top) and size in pixels (read-only). Display settings for adjusting the display mode and the rendering quality / performance. Automatically switch to fullscreen mode when rotating the mobile device to landscape mode (Android only). Enable the side-by-side Stereo-rendering mode. When the <image> is defined as stereo-image, then the left side will show the left image and the right side the right image. Without stereo-image both sides will show the same image. The stereo-rendering mode can be used for VR displays. The WebVR plugin will enable this mode automatically when entering the VR mode. The stereooverlap setting defines the overlapping of the left and right images: 0.0=no overlap, 1.0=full overlap. The WebVR plugin will use this setting for the IPD (Interpupillary distance) and lens settings. and for 3D-TV screens with 3D-HSBS-support a setting of 0.5 should be used. Define which side from stereo-images should be used for the normal monoscopic rendering: 1 = left, 2 = right. Enable the 3D-Anaglyph (red/cyan) Stereo-rendering mode. auto - All coordinates are relative to the safe-area (inside it). h-only - Same as auto, but only the horizontal part of the safe-area will be respected, vertically the full display height will be used. off - The safe-area will be ignored, all coordinates are relative to the full display area. Here the inset of the safe-area would need to managed manually via display.safearea_inset in the onresize event. test:t r b l - set custom safearea-inset values to test/simulate the device support. Note - to place a layer outside the safe-area use set the <layer> setting safearea=false. When the display of the device has a 'safe-area' and the browser supports the safe-area-inset CSS variables, then this variable will be an Object with information about that safe-area. Otherwise it will be null. When the value of one of these variables is positive, then this is the safearea size outside of the krpano viewport. When it is negative, then the safearea is inside the viewport. These values can change anytime when the device will be rotated, so they should be used only in the onresize event. Set the maximum pixel size for a CSS3D cube-face-image (non-tiled, non-multires). Larger images will be automatically downscaled to this size. This setting should be only used together with the devices setting for certain devices and situations. On mobile and tablet devices the <mobile> images will be used by default (for non-multires images). With the usedesktopimages setting, it is possible to tell the viewer to use the desktop images also on these devices. Define if mipmapping should be used when displaying panos with WebGL. 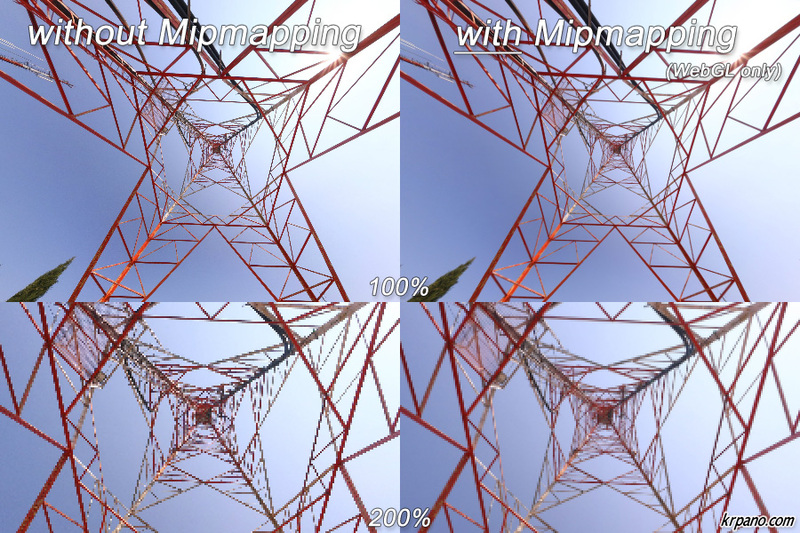 Mipmapping can give a better visual quality and reduce aliasing. Technically mipmapping is only possible on images/tiles that have power-of-two sizes. 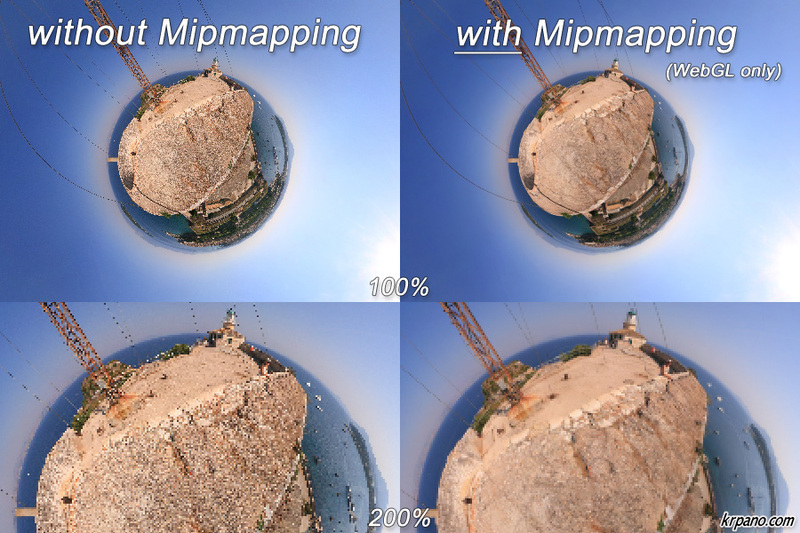 Automatic mode - use mipmapping automatically when the size of a cube-face-image is a power-of-two size like 1024px, 2048px or 4096px for non-tiled, single-res panos - or - when the tilesize is like 256px, 512px or 1024px for tiled/multires panos. Force the usage of mipmapping - this will be done by automatically resizing images to the next available power-of-two size. Note - the automatic resizing can cause a short delay on loading. Control the tile reloading during movement (panning, zooming). The loading and adding of new tiles can interrupt smooth movements on slow devices. Always instantly load and add tiles. No reloading during direct on-the-screen user-interactions. Slightly delayed and scheduled reloading during movements without direct user-interaction (scripted lookto movements, autorotate, gyro, ...). No reloading during any movements. Reload only on halt. Adjust / scale the size of the WebGL frame buffer. A smaller number mean a lower resolution and fewer pixel to calculate. This could be used on slower mobile devices to increase the rendering performance. Define the appearance of non-distorted hotspots in VR mode. "natural" (the default) - the hotspots will be keep rotated toward the viewers eyes. "screenspace" - the hotspots will be keep rotated toward the device screen (same as in normal non-VR viewing, but in VR there is no flat screen and so screen orientated things are looking wrong). The framerate in frames per second (fps) of the Flashplayer. It should be something between 30 and 100, the default is 60. Note - in the Flashplayer there is only one global framerate, this means the framerate setting can affect other flash elements when their animation is based on the framerate. Internal rendering tesslation details, a higher details value will result in a more detailed internal 3D-geometry. When using the Flashplayer 10 and cubical images without any distortion (fisheye, stereographic, ...) then this setting will be ignored, because a tesslation will be no necessary. -1 means 0 for spheres and 3 for cubes. The Flashplayer rendering quality while moving. The Flashplayer rendering quality when not moving for stilltime seconds. Enable/disable the usage of the Flashplayer 10 rendering possibilities. Since the Flashplayer 10 there are new rendering functions in the Flashplayer avialable. This functions allow to render flat surfaces (bitmaps) with a perfect 3D perspective distortion. In the older Flashplayer 9 on the other side, it was only possible to simulate the 3D perspective distortion bytesslating/spliting the 3D model into many small elements and draw the small elements without perspective distortion. Note - when using the fisheye / stereographic distortion it is still necessary to tesslate/split the 3D model into many small elements. This can be slow with the usage of the Flash10 rendering functions. Therefore it would be recommended to disable Flash10 for that usage. When the rendering quality is set to HIGHSHARP then the rendered image will be sharpened as post-process. With the sharpen setting it is possible to control the strength of that sharpen effect. Possible values are from 0 to 14. The time in seconds after last movement in the pano before swtiching from movequality(10) to stillquality(10). Show the polygons of the internal 3D geometry. * HIGHSHARP (Flash only): after rendering the pano in HIGH quality, the image will be additionally postprocessed with a 1 pixel unsharp-mask filter, this setting needs a lot of processing power so it should be only used for stillquality. The mouse and keyboard control settings. Note - when the krpano viewer shouldn't capture the mouse-wheel usage over the viewer (e.g. to allow scrolling the webpage instead of zooming the pano), then have also a look at the mwheel embedding setting. all - all controls - mouse, touch and keyboard. mouse - mouse and touch controls only (no keyboard). keyb - keyboard control only (no mouse/touch). off - no user control. Set the control mode for the mouse and touch usage. drag - drag the pano image. moveto - move the pano image. drag3d - free-axis 3d dragging (Flash only). true - When enabled (the default) a 'relative' mapping between the drag control input and the pano view movement will be used. This is less accurate but gives a better control feeling at larger field-of-views and when using fisheye distortions. false - When disabled an 'absolute' mapping between the drag control input and the pano view movement will be used. That means when dragging point A in the pano image to point B. the view will exactly follow that movement. At smaller field-of-views (when zoomed in) both modes will be near the same. The inertia of the dragging control. The higher the value, the fewer the momentum of the view rotation when releasing the control. The friction of the view rotation momentum of the dragging control mode. The lower the value, the quicker the movement will stop. In version 1.19 the behavior of the dragging control was slightly changed. Due these changes the speed and momentum is slightly different. By enabling this setting the old mode can be used. true - When enabled (the default) a 'relative' mapping between the moveto control input and the pano view movement will be used. This is less accurate but gives a better control feeling at larger field-of-views and when using fisheye distortions. false - When disabled an 'absolute' mapping between the moveto control input and the pano view movement will be used. The movement acceleration of the moveto control mode. The higher the value, the quicker the pano will start rotating. The maximum moving / rotating speed of the moveto control mode. The friction of the view rotation momentum of the moving control mode. The lower the value, the quicker the movement will stop. An additionally friction for the vertical movement in the moveto control mode. Can be used with values lower than 1.0 to make the vertical moving less responsive. The acceleration of the keyboard / button controlled moving. The maximum moving speed of the keyboard / button controlled moving. The moving friction of the keyboard / button controlled moving. Invert the keyboard / button up and down moves. The keyboard / button fov (zoom) change in degrees (=zoom sensibility). The mouse-wheel fov (zoom) change in degrees (=mouse-wheel zoom sensibility). The maximum fov change / zooming speed (for mouse-wheel and keyboard / button control). The friction of fov (zoom) changes. When enabled and zooming in by the mouse-wheel the pano will zoom toward the position of the mouse cursor. When zoomtocursor and this setting are enabled and zooming out by the mouse-wheel the pano will zoom away from the position of the mouse cursor. Otherwise the pano will zoom away from the center of the screen. Enable or disable the 2-finger zoom gesture. Keyboard keycodes for moving left (separated by commas). Keyboard keycodes for moving right (separated by commas). Keyboard keycodes for moving up (separated by commas). Keyboard keycodes for moving down (separated by commas). Keyboard keycodes for zooming-in (separated by commas). Keyboard keycodes for zooming-out (separated by commas). Enable or disable the auto-repeating of the onkeydown event when a key is hold down. The auto-repeating delay and repeating interval depends on the system keyboard settings. Bounce back when hitting the panning or zooming limits (drag control only). By using the standard, dragging and moving settings it's possible to select native system cursors for these states. By using the url setting it's possible to use custom images for the cursor. In this case the url image contains all different mouse states within one image (this reduces the necessary download requests and speeds up loading). The individual images will be selected by defining cropping pixel coordinates for the moving states. Select the native CSS mouse cursor for the current state (HTML5 only). Path/url to the cursors images. This image must contain all images for all cursor states. The image for the certain cursor is selected by defining the position and size of a (crop) rectangle. Automatic rotation / moving / zooming when there is no user-interaction. For getting feedback about autorotation changes, these autorotate events could be used: onautorotatestart, onautorotatestop, onautorotateoneround and onautorotatechange. Enable / disable the automatic rotation. The time in seconds to wait after the last user-interaction before starting the automatic rotation. The rotation acceleration in degrees/second. The maximum rotation speed in degrees/second. Use a negative value for a rotation to left. Move / rotate to the given horizon (0.0 = middle of the pano). Set the value to "off" or any other non-number value to disable it. Zoom to the given field of view (fov). Set it to "off" or any other non-number value to disable it. Slow down the autorotation speed relative to the current zoom / field-of-view to get the same visual speed at all zoom distances. Define which events will interrupt the autorotation (and also the onidle event). A change of the pano-view by the user via mouse or touch. An interaction with layer or hotspot elements. Is the pano currently auto-rotating? Is the auto-rotating currently paused? Enable and directly start the autorotation now (without autorotate.waittime). Stop the current autorotation and disable it. Stop/interrupt the current autorotation - same as an user interaction interrupt. The autorotation itself will kept enabled and will start again after waittime seconds without user interaction. Either pause the current autorotation, or when the autorotation is currently not running, then don't start it as long as it is paused. E.g. could be used when the mouse hovers a hotspot to pause there. Resume a previously paused autorotation. The <layer> or <plugin> elements can be used to include images, logos, buttons or dynamic plugins (e.g. krpano plugins). To combine, stack, sublayer several <layer> or <plugin> elements, either the parent setting can be used, or the children <layer> / <plugin> elements can be declared as child xml elements. In this case the parent and keep will be automatically assigned to the parent element. Note - the <layer> or <plugin> elements are internally exactly the same elements, only with different names! The usage of 'layer' instead of 'plugin' is recommended because it describes the element better. The name 'plugin' is from older krpano versions and only there for backward compatibility. The count of all layer / plugin elements. Enable/disable the whole layer / plugin layer for receiving mouse events. Show/hide the whole layer / plugin layer. Controls the transparency / alpha of the whole layer / plugin layer. Actionscript 3 Sprite object of the layer / plugin layer. The name of the current layer / plugin element (see the name notes). The index of the current layer / plugin element. Type of the layer / plugin element. The default - uses the url file as image. Use this layer / plugin as container element for other layer / plugin elements. The layer / plugin element need to have width and height settings! The container element can have a background shape, which can be controlled by the bgcolor, bgalpha, bgborder, bgroundedge, bgshadow and bgcapture settings. Use this layer / plugin as textfield. Supported file types: JPG, PNG, GIF and SWF (Flash-only). Should this layer / plugin element be kept or removed when loading a new pano. See also the loadpano() action. Visibility of the layer / plugin element. Enables the layer / plugin element to receive mouse events. When set to "false" then the mouse events will be routed to the underlying elements. Show a hand cursor when mouse is over the layer / plugin element. When set to true then all children elements that are outside of the parent element will be clipped / masked out. HTML5 Safari / iOS notes - the when using maskchildren=true on a container element that has rounded edges and shadows (by using the bgroundedge and bgshadow settings) then the children elements will be not clipped on the rounded edges. This is a bug of the Safari browser (Desktop and iOS), all other browsers are fine. Deep / 'Z' ordering of the layer / plugin elements. This value can be any string or number. All layer / plugin elements with a zorder setting will be sorted by the given value. When nothing is set - then the order is undefined and depends on the loading/finishing order of the browser. Note - this is an important setting for overlapping elements! HTML5 Notes - the zorder should be a value between 0 and 100, no negative values! When enabled=true and capture=true then the mouse events will be only sent to this layer / plugin, no movement / controlling of the pano is possible. When enabled=true and capture=false then the mouse events will be sent to the layer / plugin and also to all underlying elements, controlling the pano will be still possible. Enables the children elements of the current layer / plugin element for receiving mouse events. Preload the layer / plugin url before loading the pano and before executing any actions. This can be used to force some element to be there and ready before everything else starts. Note - the onloaded event doesn't work / can't be used when preloading is enabled! Blending / mixing mode - possible settings: normal, layer, screen, add, subtract, difference, multiply, overlay, lighten, darken, hardlight, invert. Load the attributes from one or more <style> elements. This can be used to reduce the xml code - the attributes that are the same for more layer / plugin or hotspot elements can be stored together at one place in a <style> element. To specify more than one style, separate the style names by pipe | characters. Note - the attributes that were defined in a style can NOT be overwritten in the layer / plugin / hotspots definition! A style can be also loaded dynamically by the loadstyle(name) action. Alignment / origin-point position of the layer / plugin element on the screen. When NOT set (the default) no positioning will be done by krpano (useful / necessary for some flash/swf plugins). Edge / anchor-point of the layer / plugin element. When NOT set (the default) the same setting as in the align attribute will be used. Should the layer be relative to the safe-area of the display or to the full-display-area. Distance from the align point to the edge point. This can be a absolute pixel value or a relative (to the screenwidth or screenheight) percent value. Note - for right/bottom aligned elements this distance will be measured from the right/bottom side. Offset / parallel-shift of the layer / plugin element. This values will be added to the x/y values. This can be a absolute pixel value or a relative (to layer / plugin size) percent value. Rotation of the layer / plugin element in degrees. Destination size of the layer / plugin element - the image will be scaled to that size. This can be a absolute pixel value or a relative (to the screenwidth or screenheight) percent value. When not set - the size of the loaded image will be used. Negative values - when using negative values as size, then the resulting size will be the size of the parent element (or the size of the stage when there is no parent) minus the given negative value. Additionally it's possible to use the special value "prop" to scale an image via width or height by keeping it proportions (e.g. set width or height to a value and the other setting to "prop" - width="500" height="prop"). Limit the resulting layer size. Only absolute pixel values are possible for these settings. When the value for a min/max setting is 0, it will be disabled/ignored. Dynamic changes of these settings will not trigger an instant update of the layer element. These variables contain the original unscaled pixel size of the loaded image, this information are first available after the onloaded event. These variables contain the final pixel size of the element, but note - they don't get updated immediately when changing the normal width/height/scale variables, the update happens after a screen refresh or when calling the updatepos() action. These variables contain the final pixel position of the element, but note - they don't get updated immediately when changing the align/edge/x/y/ox/oy variables, the update happens after a screen refresh or when calling the updatepos() action. Note - the values can differ between Flash and HTML5 when layering or scaling is involved due different technical implementations. Scaling of the layer / plugin element. Enabling a pixel accurate hit testing which respects the transparency of the image instead of using the bounding box (Flash only). Note - use this setting with care! The pixel accurate hit-test is a much heavier operation than the normal default bounding box check! When set to 0 (the default) the pixel positions will be rounded to full pixel values. When set to 1 no rounding of the position values will be done, but then the image can become blurry due this. Note - if accuracy=1 would work depends also on the Flashplayer display quality settings and if the browser is supporting sub-pixel-precise CSS coordinates. Alpha value / transparency of the layer / plugin element. Note - even when set to 0.0 - the element will be still there and click-able - to hide it completely the visible attribute must be set to false! When set to "true", then visible will be automatically set to "false" when alpha is 0.0 and back to "true" when alpha is bigger then 0.0. When a .swf file will be loaded, then are two possibilities to determinate its size / dimension - either the size of full canvas of the flash object will be used (usecontentsize=false, the default) - or - only the size of the drawn content there (usecontentsize=true). Defines a grid in pixel coordinates that splits the layer / plugin image into 9 segments. And when scaling the layer / plugin via the width / height / scale values, the 'edge' segments will be kept unscaled and only the 'middle' segments will be scaled. When using scale9grid, then scalechildren always will be false. Crop / cut out a rectangular area of the source image. Usefull to use only one single image for serval image elements. onovercrop / ondowncrop - different crop areas for mouse over and mouse button down states. Assign the current layer / plugin to be a child element of an other layer / plugin or hotspot element. The assigned layer / plugin will be aligned inside the parent element. STAGE - this parent allows to align a layer / plugin OUTSIDE the pano area. BGLAYER - this parent allows to align a layer / plugin BEHIND the pano. Note - distorted hotspots can't be used as parent at the moment! Should a child layer / plugin element, that have been assigned by parent also be scaled when the current layer / plugin element will scaled. Use an other layer / plugin or hotspot image as mask. The image should have an alpha channel (e.g. use a .png image for it). Without alpha channel the bounding box area of the layer / plugin will be used as mask. Note - for rendering performance reasons the mask shouldn't not be used with distorted hotspots! HTML5 Notes - for masking children elements that works the same in Flash and HTML5 use the newer maskchildren setting. Apply bitmap effects to the layer / plugin image. Background color of the container element (only available when type=container). Transparency / alpha of the background color of the container element (only available when type=container). Add borders around the type=container layer element. The border line-widths. This can be either just one size value for all sides or a comma separated list of values to define different widths for each side. 1 value ⇒ use the same width for all sides. 2 values: 1,2 ⇒ 1=Top&Bottom, 2=Left&Right width. 3 values: 1,2,3 ⇒ 1=Top, 2=Left&Right, 3=Bottom width. 4 values: 1,2,3,4 ⇒ 1=Top, 2=Right, 3=Bottom, 4=Left width. The color of the border lines. The default is 0x000000 (black). Transparency / alpha of the border lines (0.0 to 1.0, default=1.0). Define rounded edges of the container background color shape. A value sets the edge rounding radius in pixels. Four values can be set, one for each edge (separated by space characters). They are given in the order: top-left, top-right, bottom-right, bottom-left. If bottom-left is omitted, it is the same as top-right. If bottom-right is omitted, it is the same as top-left. If top-right is omitted, it is the same as top-left. Add a shadow behind the type=container layer element. bgshadow="xoffset yoffset blur color alpha"
bgshadow="xoffset yoffset blur spread color alpha inset, ..."
The offset / distance of the shadow in pixels. The blur radius / range in pixels - defines how strong the shadow will be blurred. 0 = no blur ⇒ sharp edges. Spreading of the shadow in pixels - expand (positive values) or shrink (negative values) the shadow. The alpha / transparency of the shadow. When the text "inset" will be added as last parameter, then the shadow will be an inner shadow instead of an outer shadow. Add another shadow (comma separated). Capture mouse events on the background of the container element (only available when type=container and bgalpha > 0.0). A boolean read-only variable that indicates that the layer / plugin is currently loading an image. A boolean read-only variable that indicates that the layer / plugin has loaded the given image. The loadedurl attribute contains the full url of the currently loaded image. A boolean read-only variable that indicates that the mouse cursor it currently over the layer / plugin. A boolean read-only variable that indicates that the mouse button was pressed on the layer / plugin and is still hold down. Actions / functions that will be called when the mouse moves over the layer / plugin element. Actions / functions that will be called in intervals (15 times per second) when the mouse stays	over / hovers the layer / plugin element. Actions / functions that will be called when the mouse moves out of the layer / plugin element. Actions / functions that will be called when there is a mouse click on the layer / plugin element. Actions / functions that will be called when the mouse button will be pressed down on the layer / plugin element. Actions / functions that will be called when the previously pressed mouse button will be released. Actions / functions that will be called when the loading of the layer / plugin image is done. Flash: Actionscript 3 Loader object of the loaded layer / plugin image. Flash: Actionscript 3 Sprite object of the layer / plugin element. HTML5: HTML DOM element (div) of the layer / plugin element. An action of the layer / plugin element to load settings from a <style> element. The registercontentsize action can be used to set / register the 'original / source / unscaled' size of the layer / plugin element. By default the imagesize or the size of the swf file will be used - this source size can be changed here. An action to set the width and height values back to the source size of the loaded image. This can be used after changing the url value to get the size of the new loaded image. Updates / recalculates the position and size of the layer / plugin immediately (normally this will be done automatically with the next screen refresh). After calling this actions the pixelwidth and pixelheight variables will contain the final pixel sizes of the layer / plugin element. An action to change the alignment and edge of a layer / plugin element without changing its current position. The x/y values will be recalculated to keep the current position. A function that returns the full path/name of the layer / plugin element. Because of the return value this action is only callable from the plugin interface. The count / number of all hotspot elements. Enable/disable the whole hotspots layer for receiving mouse events. Show/hide the whole hotspots layer. Controls the transparency / alpha of the whole hotspots layer. Actionscript 3 Sprite object of the hotspots layer. The name of the current hotspot element (see the name notes). The index of the current hotspot element. Type of the hotspot element. Use this hotspot as textfield. Note - when "url" will be set, then the hotspot will be an image hotspot and not a polygonal hotspot! Should this hotspot element be kept or removed when loading a new pano. Select the renderer for displaying the hotspot. The default setting depends on the browser-support. When WebGL is available, it will be used by default, otherwise CSS3D. Visibility of the hotspot element. Enables the hotspot element to receive mouse events. When set to "false" then the mouse events will be routed to the underlying elements. Show a hand cursor when mouse is over the hotspot element. When set to true then all child elements that are outside of the parent element will be clipped / masked out. Deep / "Z" ordering of the hotspot elements. This value can be any string or number. All hotspot elements with a zorder setting will be sorted by the given value. When nothing is set - then the order is undefined and depends on the loading/finishing order of the browser. HTML5 Note - the zorder should be a value between 0 and 100, no negative values! The zorder2 setting is for ordering normal and distorted hotspots in the HTML5 viewer. Due browser/css related limitations it is not always possible to mix / order normal hotspots and distorted hotspots withhin the same layer. But by using the new zorder2 setting, it is possible to define if a normal, non-distorted hotspot should be above or below the other distorted hotspots. zorder2=0.0 - The current hotspot is below distorted hotspots (default). zorder2=1.0 - The current hotspot is above distorted hotspots. When enabled=true and capture=true then the mouse events will be only sent to this hotspot, no movement / controlling of the pano is possible. When enabled=true and capture=false then the mouse events will be sent to the hotspot and also to all underlying elements, controlling the pano will be still possible. Enables the children elements of the current hotspot element for receiving mouse events. normal, layer, screen, add, subtract, difference, multiply, overlay, lighten, darken, hardlight, invert. Should the hotspot image get mip-mapped during rendering (e.g. to avoid aliasing when scaled down). When enabled, this works only when the pixel-sizes (width and height) of the hotspot image are power-of-two sizes. Only available for WebGL rendering. Multiply the alpha channel of the hotspot image into the color channels. Will be mapped to the WebGL UNPACK_PREMULTIPLY_ALPHA_WEBGL setting. The spherical coordinates of the hotspot in degrees. There the hotspot image will be aligned by the in the edge setting defined point. Edge / anchor-point of the hotspot element. Offset / parallel-shift of the hotspot element from the edge point. This can be a absolute pixel value or a relative (to hotspot size) percent value. Should the size of the hotspot image change together with the pano when zooming. Should the hotspot image be distorted in the 3D space together with the current pano/viewing distortion. When distorted use rx / ry / rz settings to rotate the hotspot in 3D space. Note 1 - When enabled, a size of 1000 pixels will be used as reference for pixel sizes. And this 1000 pixels are covering a field of view of 90 degrees in 3D space. Note 2 - Distorted hotspots can't and shouldn't have children elements. They will be probably not displayed correctly. Note 3 - Displaying Flash plugins as distorted hotspots should be possible but not the direct interaction with them. In this case the plugin will not display directly, only a kind of 'screenshot'-image of it. Note 4 - In HTML5 the sorting of normal and distorted hotspots via zorder is not possible, the zorder2 setting can be used additionally for normal hotspots to move them above the distorted hotspots. Note - can only be used when distorted="true"! The internal 3D rendering depth - that's the distance of the 3D object to the screen. For 2D viewing this has no visible effect, but for stereo 3D/VR viewing this can be important setting. E.g. use smaller values for a stronger 'pop-out' effect. When a hotspot image should be infinity far away (like the pano image itself, e.g. to pixel-perfectly match the pano-background) then an 'invalid' value (e.g. a String like "off") should be used for the depth setting - e.g. depth="off". 3D translation offsets (only available for distorted hotspots). Settings for shifting / translating the hotspots in 3D space. Inverses the rotation and the axis order of the rx / ry / rz settings. This setting interpolates automatically the ath/atv and scale values to the current viewing values. The value range is from 0.0 to 1.0. At 1.0 the hotspot image will be locked always to the middle to screen and it's size will be relative to 1000 pixel in screen height. Scale the hotspot from 'pano-space-size' to 'screen-space-size' when flying out. For VR usage it can be useful to disable that setting, because in VR there is no real 'screen-space'. Destination size of the hotspot element - the image will be scaled to that size. Note - when using distorted hotspots, then the size is relative to an internal base-size where 1000 pixel are covering a 90 degree field of view. Scaling of the hotspot element. Rotation of the hotspot element in degrees. Note - this setting should NOT be used together with distorted="true"! Enabling a pixel accurate hit testing which respects the transparency of the image instead of using the bounding box. When set to 1 no rounding of the position values will be done. When set to 0 the pixel positions will be rounded to full pixel values. Alpha value / transparency of the hotspot element. Defines a grid in pixel coordinates that splits the hotspot image into 9 segments. And when scaling the layer / plugin via the width / height / scale values, the 'edge' segments will be kept unscaled and only the 'middle' segments will be scaled. Define if the hotspot image is a stereoscopic image (HTML5 and WebGL only). Crop / cut out a rectangular area of the source image. Useful to use only one single image for several image elements. Should a child layer / plugin element, that have been assigned by parent also be scaled when the current hotspot element will scaled. The fill-color and alpha (transparency) of a polygonal hotspot area. The width, the color and the alpha (transparency) of a polygonal hotspot border line. Draw a line-polygon instead a filled-polygon. The start and end points will not be joined. The spherical coordinates of the polygonal hotspot points in degrees. A boolean read-only variable that indicates that the hotspot is currently loading an image. A boolean read-only variable that indicates that the hotspot has loaded the given image. A boolean read-only variable that indicates that the mouse cursor it currently over the hotspot. A boolean read-only variable that indicates that the mouse button was pressed on the hotspot and is still hold down. Actions / functions that will be called when the mouse moves over the hotspot element. Actions / functions that will be called in intervals (15 times per second) when the mouse stays over / hovers the hotspot element. Actions / functions that will be called when the mouse moves out of the hotspot element. Actions / functions that will be called when the mouse button will be pressed down on the hotspot element. Actions / functions that will be called when there is a mouse click on the hotspot element. Actions / functions that will be called when the loading of the hotspot image is done. Flash - The Actionscript 3 Loader object of the loaded hotspot image. HTML5 - The HTML Image element of the loaded image. Flash - The Actionscript 3 Sprite object of the hotspot. HTML5 - The HTML <div> element of the hotspot element. Note - only available when rendering the hotspot via CSS3D (see the renderer setting)! An action of the hotspot element to load settings from a <style> element. A function that returns the full path/name of the hotspot element. Because of the return value this action is only callable from the plugin interface. This functions saves the center position of the hotspot to the given variables. When the variables don't exist they will be created. AS3/JS: This function is also callable direct from AS3/JS. In this case it is not nesecery to use the ath/atv parameters, the function directly returns an AS3 Object with the center ath/atv coordinates of the hotspot. This object has x and y attributes, where x=ath and y=atv. The krpano events - they can be used to call actions or functions when something particular happens. These are the events that were defined in <events> elements without a name attribute. There can be always only one global event. When there is another <events> element in the xml with the same events the previously defined events were overwritten. Note - when loading an other xml file or another scene, all global events will remain and be unchanged unless they are defined again in the new xml or scene. When an <events> element in the xml will be defined with a name attribute - then this will be an independent events element. It can contain any of the events, but they will not overwrite the global events, they will be called additionally to it. These 'named' <events> elements have also a keep attribute (with the default value "false"). That means <events> elements without keep="true" will be automatically removed when an other pano will be loaded. Tip - the named events are a good way for plugins or independent / includeable xml code to use the krpano events without interfering with other plugins or other code. When a name attribute will be defined then this events element will be an independent local events element. Without name attribute the global events were set. Should this named <events> element be kept or removed when loading a new pano or scene. See also the notes in the loadpano() action. This event will be called when switching to fullscreen mode. This event will be called when switching back from the fullscreen mode to the normal window mode. This event will be called when the loading of the xml file or the xml code of scene was completed. After this event the user-control, the pano-viewing and the dynamic loading of the pano images will start. This event will be called when the loading of the preview image was completed. This event will be called when the loading of the pano image is done. When using multi-resolution images, then this event will be called once when all parts for the current-view were loaded completely. This event will be called when there is a new pano image and all information about it (type, imagesize, hfov, vfov) are available. This event will be called when the current pano will be removed (e.g. before a new pano will be loaded). This event will be called when a new scene will be loaded (similar to the onxmlcomplete event but only for scenes). and the onloaderror event on image-loading errors (all kind of images: pano, layer or hotspot images). When an event will be not set, then the default error processing will be done - that means a fatal-error on xml-errors and an error message in the krpano log on image-errors. By using the onxmlerror event and some custom error handling, it would be still possible to continue using the viewer on an xml-error. The error message will be stored in the lasterror variable. Note - the onxmlerror event is only available in the HTML5 viewer! This event will be called when a key is pressed down. They keycode of the pressed key will be stored in the keycode variable. When a key will be hold pressed down, then the system automatically sends repeating onkeydown events. This could be optionally disabled with the control.keydownrepeat setting. This event will be called when a pressed key is released. They keycode of the released key will be stored in the keycode variable. This event will be called when there was a mouse click in the pano. Special events for single / double click detection. Different to the normal onclick event (which will be fired instantly on every click) the onsingleclick event can be delayed a bit (up to ~400ms) because it checks if there might be a second click for detection as double-click. One single-click event (delayed a bit compared to a normal onclick event). Two single-click events - when the mouse was moved too far between the two clicks. One double-click event - when there were two quick clicks and almost no mouse-movement between them. The mouse.clickx and mouse.clicky variables are storing the coordinates of the mouse where the last click had happened. Touch usage is also supported (e.g. 'tap' and 'double-tap'). This event will be called when the mouse button was pressed down in the pano. This event will be called when the previously pressed mouse button was released. This event will be called when the mouse-wheel was used or when the pano was zoomed by a touch zoom-gesture. The delta of the mouse-wheel usage will be stored in the wheeldelta and wheeldelta_raw variables. On touch devices there is no real mouse-wheel, but this event will be called too when using the 2-finger zooming gesture. The wheeldelta variables will be set to positive or negative values depending if zooming in or out. The wheeldelta_touchscale variable will provide more detailed information about the gesture zooming in this case. This event will be called before the contextmenu will be opened and could be used to modify the contextmenu items (e.g. changing the caption or the onclick action) before displaying to match the current situation or need. This event will be called after idletime seconds without user-interaction. This event will be called every time when the current view has been changed or when the pano will be rendered / redrawn. The evaluation of the view settings and the applying of the viewing limitations settings is not done at this event. That means in this event it's still possible to make changes to the view before the final rendering. Note - use this event carefully, when doing too much stuff there it can affect the rendering/execution performance! This event will be called every time when the current view had been changed or when the pano had been rendered / redrawn. This event will be called when the size of the viewer (or the size of the area) has been changed. Additionally the onresize event will be called every time when loading a new pano (e.g. to allow custom user-interface updates). The new viewer size will be stored in the stagewidth and stageheight variables. The size of the new area size will be available via the area.pixelwidth and area.pixelheight variables. This event will be called when when the automatic rotation starts. E.g. when the autorotate.enabled setting is enabled and there was autorotate.waittime long no user interaction or when the autorotate.start() action was called. It could be used to show a special kind of auto-tour-mode user-interface (or e.g. hide the normal user-interface). This event will be called when the automatic rotation stops. Typically when the user interrupts the rotation or when the autorotation gets disabled or stopped. It could be used to restore everything that was changed in onautorotatestart. or one left-right-pan for partial or flat panos was be made. That could be used to switch to the next pano in the tour - e.g. for 'automatic tours'. This can look nice when using the KEEPMOVING flag to blend between the panos during the automatic rotation. This event will be called when the autorotate.enabled setting has been changed. Could be used to update the state of the autorotate-button. With <action> elements it's possible to define krpano actions. These actions are similar to functions or procedures in other scripting or programming languages. Inside a normal <action> element a sequence of krpano action calls can be placed. These action calls will be executed one after the other when the action gets called. When calling an action it's possible to pass arguments / parameters to it. To get the given parameters in the action code numeric placeholders in the form from %0 to %99 can be used. Where %0 is the name of the action itself, %1 the first parameter, %2 the second parameter and so on. These placeholders can be used anywhere and anyhow in the code. Before the actual action code will be parsed and executed, all placeholders will be replaced by their parameter values. When there will be no parameter for a given placeholder, the value 'null' will be used. To use the % character in the action, %% need to be used. In that args attribute variables names for the given action arguments / parameters can be defined (separated by commas). Each action argument will be mapped to a new variable in the local scope with the name that was set in the args attribute. These variables can be used normally like any other variables in the action code (e.g. read via get / calc / copy). When there will be no action argument for a given variable, the value 'null' will be used for it. Using the variable-mapping can be very useful when working with values that contain quote or comma characters. The normal placeholder-replacing can be problematic in such cases. Note - it would be recommend to use the argument-to-variable-mapping where possible. Actions without %N placeholders can be internally cached, which makes the execution of further calls faster. krpano - the krpano Interface object (get, set, call, trace, ...). args - an array with the passed arguments (args = the name of the action, args = first parameter, ...). caller - the object of the <layer>, <plugin> or <hotspot> element that has called that action. resolve(str) - a function for resolving / getting the value of a krpano variable/path. It works like the default krpano variable resolving - when the given variable/path exists, then the value will be returned, and when not, then the passed value will be returned as it is. When no name will be set, an automatic generated name will be used (e.g. could be used for autorun actions that will never be called directly). New variables will be added to the global variable scope. Every other action or code will be able to use them as well. This can be problematic when reusing variable names, especially when the variable type will differ between the usages. New variables will be added to a local variable scope that exists only in the current action call. When the action is done or calling other actions the local scope and all variables defined in it will be not available anymore. The more complex an action is and the more temporary variables it is using, the more it makes sense to use a local scope for this action to avoid interfering problems with other actions. Some as scope=local but with the difference that all access refers only to the local scope itself by default. Access to the global scope will be only possible by the global object. Use the scope from the caller. When the action that is calling the current action has a local scope, then this one can be used/accessed in the current action as well. Define a private local scope for the action. The scope will be refereed by a custom unique NAME. This scope keeps alive between multiple action calls and can be shared across several actions. Some as scope=localonly all access refers only to the local scope itself. global scope access - When searching for variables, first the local scope will be searched and then the global one. To be able to add variables to the global scope even when using a local scope or to directly access variables at the global scope there is the global object. local scope access - To be able to ensure accessing the local scope (e.g. to define a local variable when there might be already a global variable with the same name) the current local scope is also available as local object in the action code. E.g. use def(local.i, integer, 0); to define a local integer variable named 'i'. For later access in the action code it will be enough to just use 'i' to address that variable. deferred code - Actions that will call other code later (e.g. delayedcall, tween, asyncloop, ...) will use the same scope as in the current action in that code. When an action (or any code) will be called from a plugin / layer / hotspot event, then the plugin / layer / hotspot object itself will be also available as scope for searching for variables. But only for accessing existing variables! New generated variables will be always added to the global scope. In localscope actions there is always the predefined local variable caller. When the action will be called from an plugin / layer / hotspot event (or by using callwith) then that caller variable will refer to that element. Otherwise the caller variable will be null. actionname - The name of the current action. args - A value-array of the arguments. Get the number or arguments by: args.length. caller - The plugin / layer / hotspot object when called from there, otherwise null. global - A reference to global scope. local - A reference to the current local scope itself. parentscope - A reference to the scope from the parent action, when there is no parent scope, this refers to the global scope. Map the action arguments / parameters to local variables. Requires the usage of local scope actions. The args attribute should contains a list of variables names separated by commas. The arguments are also available via an args value-array inside the action code. Should the action run automatically on start. preinit - 'Pre-Initialize' - run this action at initialization before any any other event or action (also before the onstart event). onstart - run this action on startup (directly after the onstart event). When protect will be set to true, the action[name].content variable will be not accessible. This could be to used to protect and hide the source of custom actions (e.g. when additionally defined in an encrypted xml file). This makes it possible to implement custom and secure external interfaces. The inner content of the <action> element. Can be also set or changed dynamically. The count / number of all <action> elements. Note - when loading other xml files or scenes, all current defined actions remain unchanged unless they will be defined again and become overwritten this way. Enable/disable the build-in / automatic "Fullscreen" / "Exit Fullscreen" item. Flashplayer Notes - when using native=true then using the context menu to change the Fullscreen mode is not possible anymore since Flashplayer version 11.3.300.268! The krpano viewer will automatically hide the fullscreen-item when the Fullscreen-mode is not supported or when the using it from the context-menu is not possible. Since version 1.16, the krpano viewer uses a non-native, custom-drawn context-menu. This custom-drawn menu allows things like Fullscreen-Mode-switching (not possible anymore in the native Flashplayer menu since the latest Flashplayer updates) and provides an identically look-and-feel between the Flash and HTML5 versions. To disable this custom-drawn menu to use the native system context-menu of the Flashplayer, set this setting to true. Show version information of the krpano viewer and the version of the browser or the Flashplayer at the bottom of the context-menu. Only for the custom-drawn context-menu (when native=false). Enable/disable the support of the contextmenu on touch devices. Define a custom style / look of the contextmenu. Note - setting a custom contextmenu style will be only possible for touch devices by default. For desktop systems it will be necessary to have a Branding Free License. font - a font-family name or 'default'. fontsize - a fontsize or 'default'. lineheight - the line-height in percent or 'default'. backgroundcolor - the background-color and the background-transparency - format: 0xAARRGGBB. textcolor - the item text-color. disabled-textcolor - the text-color for disabled items. borderwidth - the width of the border in pixel. bordercolor - the color of the border. borderradius - the radius of the border edges in pixel. shadow-x-offset - the x-offset of the shadow. shadow-y-offset - the y-offset of the shadow. shadow-blur-range - the blur range of the shadow. shadow-color - the color and transparency of the shadow - format: 0xAARRGGBB. innerborder - the width of the inner border in pixel. innerbordercolor - the color of the inner border. padding-top - the padding on top of all items. padding-bottom - the padding on bottom of all items. seperator-margin - the margin around the seperator. seperator-color - the color of the seperator line. seperator-second-line-color - either the color of a second seperator line (like a shadow) or 'none' for no second line. item-padding - the padding around the items. item-borderwidth - the width of the item border in pixel. item-bordercolor - the color of the item border. item-borderradius - the radius of the item border edges in pixel. item-margin - the margin around the items. item-hover-backgroundcolor - the background color when hovering/selecting the items. item-hover-bordercolor - the border color when hovering/selecting the items. item-hover-textcolor - the text color when hovering/selecting the items. item-text-left-margin - the left margin of the item text. item-text-right-margin - the right margin of the item text. Set the enter / exit fullscreen mode captions for the automatic fullscreen item. The count / number of all context menu items. The name of this item (see the name notes). The caption of the item, this is the text that will be shown in the context menu. Can be used to place the "About krpano..." item there. When no KRPANO item will be defined in the xml, it will be added automatically as last item. This item can only be removed with the Branding Free License. Can be used to place the automatic "Fullscreen" / "Exit Fullscreen" item there. When no FULLSCREEN item will be defined and contextmenu.fullscreen is set to "true", it will be added automatically as last item. The texts of this item can be changed with the enterfs / exitfs settings. The contextmenu items can be formated with simple BB-code-formated HTML code (by using [ ] instead of < >). In the HTML5 viewer all html-tags/styles can be used for styling, but in the Flash version the only the Flashplayer supported HTML tags/styles. Should a separator bar appear above the current item. Show this item only when the given condition is true. Actions to call / execute on click / select. The number of automatic download retries on loading (server) errors before showing an error message. Note - always use also a devices setting to change the default setting only for special cases and requirements! Set the maximum memory usage for the decoded image tiles in MB. The calculation of the tile memory size in MB is done by: 'tile-image-width * tile-image-height * 4 / 1024 / 1024' (e.g. a 512x512px tile needs exactly 1 MB memory). When the maxmem limit will be reached, the memory of currently not used (needed/visible) tiles will be freeed/returned. Note - use this setting with care! It can affect the performance and the browser stability. Security / Cross-Domain related Flashplayer and HTML5 settings. HTML5 CORS (Cross Origin Resource Sharing) Images. 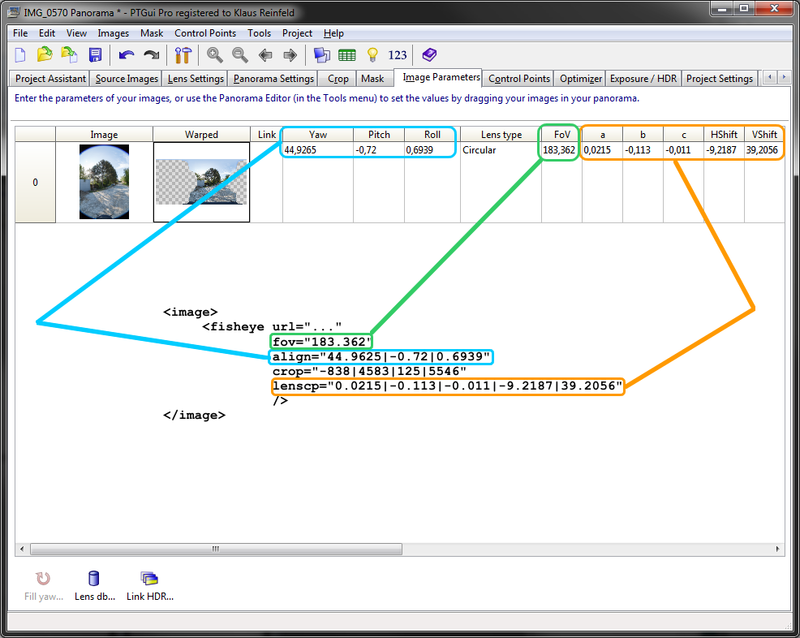 Set the default value for the crossOrigin property for all images that will be loaded by the krpano HTML5 viewer. off - no CORS usage - the crossOrigin property will not be set. Path to the crossdomain.xml on the other server. Loads a cross-domain policy file from a location specified by the url parameter. By default the Flash Player looks for the policy file located in root of a domain with the filename crossdomain.xml on the server to which a data-loading request is being made. With the crossdomain.url setting the Flash Player can load a policy file from a arbitrary locations. Allow access to other domains (necessary for plugins that want access other domains). You can also specify the special domain "*" to allow access from all domains. Specifying "*" is the only way to allow access to nonlocal SWF files from local SWF files that have been published using Access Network Only for the Local Playback Security option in the Flash authoring tool. Defines a lensflare set / style. This set can be referred with the set setting from lensflare elements. There is only one base image for the all the flares image. The flares will be defined as pice/crop of the base image, but they can have a different color and sizes. The count / number of all currently declared lensflare sets. There is predefined set named DEFAULT. The name of the current lensflare set (see the name notes). Use DEFAULT to overwrite the default one. This name can be referred by the set setting from a lensflare element. The index of the lensflareset element. The path/url to the base image for the flares. The default value is "%SWFPATH%/krpano_default_flares.jpg". The count / number of all flare element in this lensflare set. The index of the current flare element in this lensflare set. The name of the current flare element (see the name notes). It will be set automatically if not defined. The pixel size (width and height) of the crop area for the current flare image. The horizontal pixel position of the crop area for the current flare image. The vertical pixel position of the crop area for the current flare image. The mix-color for the current flare image. The source image will be multiplied with this color. Good values can be from -2.0 to +5.0. The size of the flare in relation to the screen height. Typical values are from 0.01 to 0.10. The count / number of all lensflare elements. Show / hide the whole lensflare layer. Controls the transparency / alpha of the whole lensflare layer. Actionscript 3 Sprite object of the lensflare layer. The name of the lensflare element (see the name notes). The index of the lensflare element. The lensflare set/style to use for this lensflare. Visibility of the lensflare element. Should this lensflare element be kept or removed when loading a new pano. The horizontal position of the lensflare in spherical coordinates (-180 to +180). The vertical position of the lensflare in spherical coordinates (-90 to +90). The size / scale of the flares from the lensflare element. The blinding curve (1.0 - 10.0) - it controls the increase of the strongness of the blinding when getting near the center position of the flare. A 'raw' data section. It can be used to store any kind of information or data. krpano will not parse its content. The whole content of the <data> element will be stored in the content property of the resulting data[name] object. The content itself will be not parsed by krpano, but the xml syntax rules and several automatic xml-entity-resolving processes will still apply to it! To avoid any kind of xml-syntax-parsing and xml-entity-resolving, put the whole data content inside <! [CDATA[ and ]]> tags. This way all characters and xml-tags can be used without getting parsed. Note - when loading a other xml file, all data tags remain unchanged unless they are defined again in the other xml, then they will be overwritten by the new ones. The count / number of all data elements. The name of the data element (see the name notes). When no name will be set, an automatic generated name will be used (e.g. could be used for data elements that will be accessed only via index (e.g. in a for loop) and never directly). The index of the data element. The whole content of the <data> element as text string. The scene elements are technically something like 'inline-xml' files. They can be used to define the content of a full krpano xml file again inside the current xml file. It is like a external xml, but just inlined / embedded into the current xml. The content of the scene element will not be parsed or used in any way, until loadscene() with the name of the scene will be called. The typical usage would be to define several panos from a tour inside just one xml file. When loading a new external xml file with the loadpano() action, then all currently defined scene elements will be removed. It is possible to store any custom attributes at the <scene> element - the viewer itself will ignore them, but they can be used for custom actions. The count / number of all scene elements. The name of the scene element (see the name notes). This is the name to be used when using the loadscene() action. When no name will be set, an automatic generated name will be used (e.g. could be used for scene elements that will be accessed only via index (e.g. in a for loop) and never directly). The index of the scene element (will be set automatically). The "onstart" event - here any actions / functions that will be called "on start" of the pano/scene viewing can be defined. The whole unparsed content of the <scene> element as text string. Set / define a variable during the xml parsing. This can be used to set or overwrite special variables, that weren't accessible due normal xml declarations. Any variable name or path. The value that will be set to the variable. Can be any value, text or expression. Trace / log something during the xml parsing. Note - Debug messages will be only shown when the debugmode setting is enabled! Any text, variable or expression.